You can configure validity settings for your propositions (offers that you make to customers) and mark them as always active, active only within a defined time period, or inactive. If you want your decisioning strategy to include propositions that are active only temporarily, you must define the time frame for when these propositions can be offered to customers. Defining a validity period for propositions eliminates the need to delete propositions or revise the decisioning strategy after a particular proposition or a group of propositions become obsolete. You can plan your business strategy and define propositions to become active in the future or reactivate expired propositions. On the Proposition Management landing page, you define the validity of a proposition by setting its Active (pyIsActive) property. This property sets the validity flag for propositions. A property value of Trueindicates that the proposition is valid. A property value of Falseindicates that the proposition was manually disabled or that the validity period of that proposition has expired. 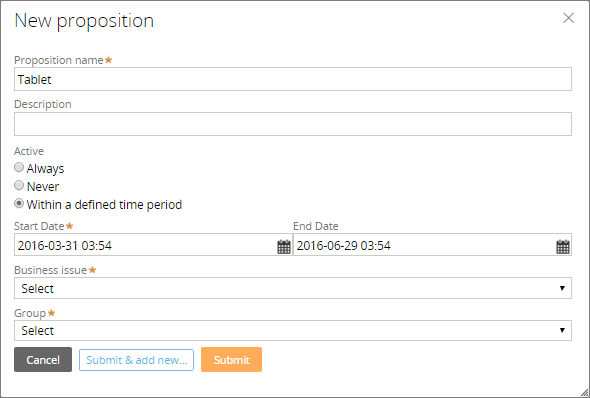 You can configure propositions as active with no validity expiration date, inactive, or active within a defined time period. Start Date (pyStartDate) - Defines the date and time when a particular proposition becomes active (that is, it can be offered to customers). The default value is the current date and time. End Date (pyEndDate) - Defines the date and time when a particular property becomes inactive (that is, it is not valid and cannot be offered to customers). The default value of this property is 90 days from the current date and time. For propositions with a defined validity period, the calculation of proposition validity is based on whether the current date and time are within the time period that is determined by the Start Date and End Date property values. If the current date and time are within the defined validity period for the proposition, that proposition is valid, and its Active property is set to True. Otherwise, the Active property is set to False. Proposition validity computation logic is located in a centralized place: the proposition cache. This location allows everyone who accesses a proposition (for example, from the Proposition Import shape, Proposition Management landing page, decision data record, or external APIs) to see whether the proposition is valid or expired. Propositions that you created prior to Pega 7.2.1 do not have a validity period. These propositions are permanently active until you define their validity period.